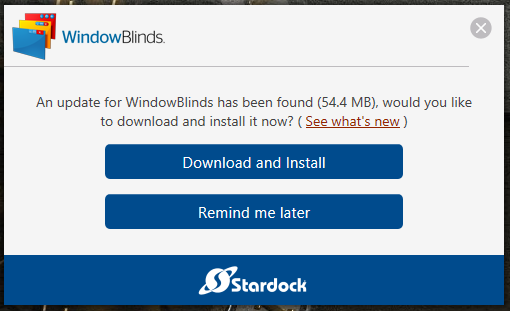 WindowBlinds keeps prompting me yo install an update. I already have the latest version available installed from my account. I've been seeing that too. If what I said below doesn't work then you have a situation I don't have an answer for. Open WindowBlinds and on left clock on About. At the bottom just un-check "Automatically check for updates once a week." What do you mean what you said below? I'm getting nagged daily. Besides that function should work. Right now it is fail. Reboot and ReInstall the latest version from your account Reboot . report beck here if OK now . For now I am going to skip the purge and re-install. When I manually tell WindowBlinds to check for an update, I get the expected message "no updates for WindowBlinds 10 have been found" The nag screen I posted looks to be generated by a Stardock server and not an error on my client side. Also, I am not having any other problems with WindowBlinds.